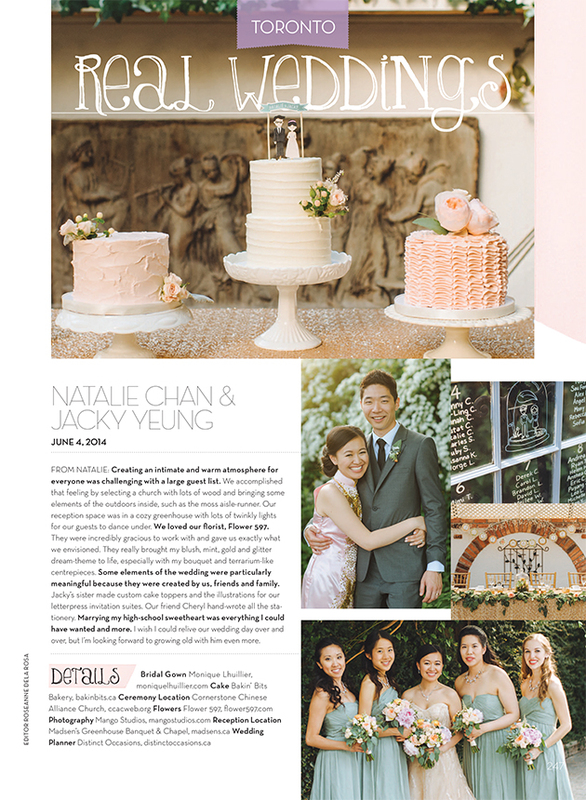 This Madsen’s Greenhouse wedding just outside of Toronto in Newmarket was perfectly warm and intimate, we’re so happy to share some of the details with you and even more excited our photography graced the pages of Weddingbells Magazine 2015 issue. Creating an intimate and warm atmosphere for everyone was challenging with a large guest list. We accomplished that feeling by selecting a church with lots of wood and bringing some elements of the outdoor inside, such as the moss aisle-runner. Our reception space was in a cozy greenhouse with lots of twinkly lights for our guests to dance around. We love our florist, Flowers 597. They were incredibly gracious to work with and gave us exactly what we envisioned. They really brought my blush mint, gold and glitter dream theme to life, especially with my bouquet and terrarium like centre pieces. Some elements of the wedding were particularly meaningful because they were created by us, friends and family. Jacky’s sister made custom cake toppers and the illustrations for our letterpress invitation suites. Our friend Cheryl hand-wrote all the stationary. Marrying my high-school sweetheart was everything I could have wanted and more. I wish I could relive our wedding day over and over, but I’m looking forward to growing old with him even more.